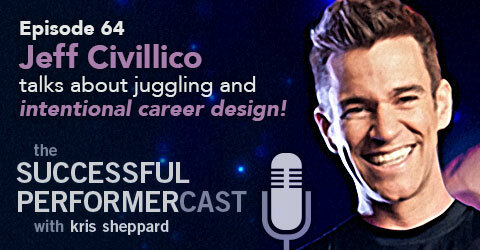 Jeff Civillico brings us into his career in juggling and gives us some practical advice when it comes to intentionally designing your own life and career. Jeff is a high-energy Vegas headliner who takes juggling, audience interaction, and lots of comedy to compose his show, “Comedy in Action,” which can be seen at the LINQ Hotel & Casino on the Las Vegas Strip. His passion has taken him around the world garnering him once-in-a-lifetime opportunities like sailing the Queen Mary II, sky diving in Australia, and getting to perform at The White House. He’s a favorite onboard the Disney Cruise Line and has performed many venues on Vegas Strip including, V: The Ultimate Variety Show, Nathan Burton, and The Improv at Harrah’s. He’s the founder and president of Win-Win Entertainment, which is a non-profit that pairs performers willing to donate their time and talent with charities in need of entertainment. He also speaks on “Branding your Passion,” which helps people design the career and lifestyle of their dreams. Not bad for someone that juggles plungers for a living. • Finding your passion VS. being a passionate person. • Passionate people find ways to channel their energy and drive. • Passionate people find ways to build things that are bigger than themselves. • Personal philosophy and values. • Taking initiative and being proactive. • Leveraging what you have for more and taking action. • Being able to pivot. • Engaging with the community. • Talks about how he got his show in Vegas with certain leverages and out-hustling his competition. • Bartering. Everyone has something that someone else needs and can be bartered. Talks very candidly about a soured business relationship with another entertainer and what he learned. Making his Vegas show profitable. Tells how he really made a difference in one woman’s life with his act. • Congruency between who you are both on and off stage. • Staying connected with his family. • Talks about how he moved out to Vegas. • Win Win Entertainment: matching charities with performers. Take action and leverage what you have for more. If something doesn’t work out, pivot. Where can we find Jeff Civillico?